Tag line: "A true story written in flame and fury"
Trivia: When getting the directing job, Enzo and a writing partner took a week to rewrite the overlong script to make it more action orientated and less of a "soap opera"
As I was perusing my DVD collection, trying to find a movie to watch, I came across Eagles Over London, a 1969 World War II film, and two things about it caught my attention. First, it was directed by Enzo Castellari, the man behind The Heroin Busters, 1990: The Bronx Warriors and the original Inglorious Bastards, all of which I enjoyed (he also helmed the excellent Keoma, my 2nd favorite Franco Nero spaghetti western after Django). I know Tarantino is a fan of Castellari’s work (his own 2009 war movie is also titled Inglourious Basterds), but to see a quote like that from a cinephile of his caliber was enough for me. I immediately popped the DVD into the player. Eagles Over London begins with the mass evacuation at Dunkirk, which the British High Command ordered soon after the Nazis gained control of France. Capt. Stevens (Frederick Stafford) and Sgt. Mulligan (Renzo Palmer) are among the thousands of troops waiting at Dunkirk for the ships that will carry them home. But what they and the rest of the army don’t know is that a team of German spies, disguised as English soldiers, has infiltrated their ranks. Led by a man named Martin (Francisco Rabel), these spies have orders to destroy the British military’s new radar system, which will clear the way for Germany to launch a surprise attack from the air (history will call it the Battle of Britain). Once in London, Capt. Stevens uncovers a series of clues that suggest there are Nazi agents operating in England, and he meets with Air Marshall George Taylor (Van Johnson) to warn him of the danger. Unfortunately, Stevens has no idea who the spies are, or what their ultimate target might be. Realizing that time is of the essence, he and his team work quickly to identify and capture the enemy agents, knowing full well that failure to do so could affect the outcome of the war. Eagles Over London is a non-stop thrill show, with plenty of gunfights, explosions, and even some fisticuffs to keep you entertained. Hands-down, the best sequence is the evacuation at Dunkirk, which Castellari recreates on a grand scale, but there’s also a battle scene late in the film, when the German agents attack a radar outpost, that impressed the hell out of me. 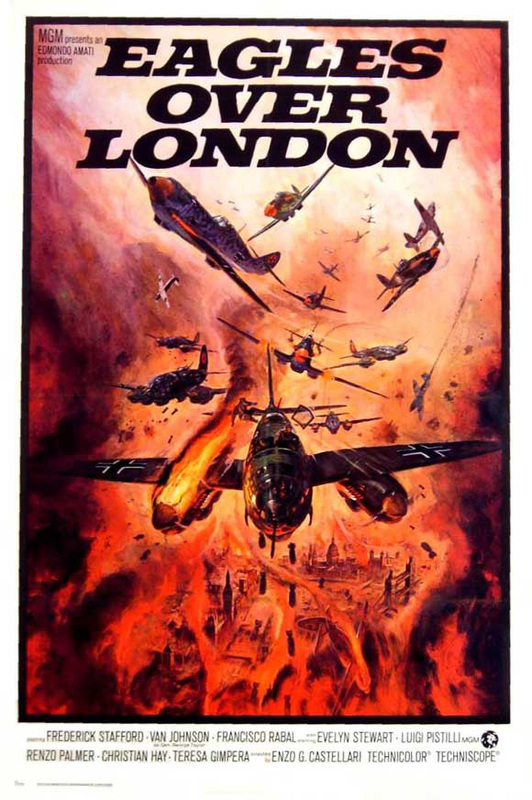 As for the movie’s depiction of the Battle of Britain, Castellari got a bit creative, relying more on studio-bound shots (of pilots in the cockpits of their planes) and stock footage to bring this famous skirmish to life (despite this economically-minded approach, it’s still damned exciting). Castellari does manage to throw a romantic entanglement into the mix (both Stevens and Air Marshall Taylor have the hots for Meg, played by Ida Galli, herself a soldier stationed at command headquarters), and there’s even a little comedy relief courtesy of Renzo Palmer’s hard-drinking, no-nonsense Sgt. Mulligan. But these elements are never more than a brief distraction, a momentary diversion to allow the audience to catch its breath. 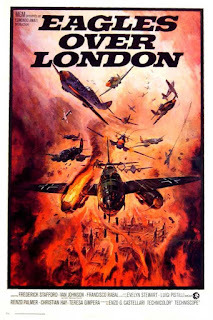 If you’re a fan of action-packed war films, then Eagles Over London should be the very next movie you watch.